KDE Software Compilation is the innovative Free Software suite that increases your pleasure and productivity. 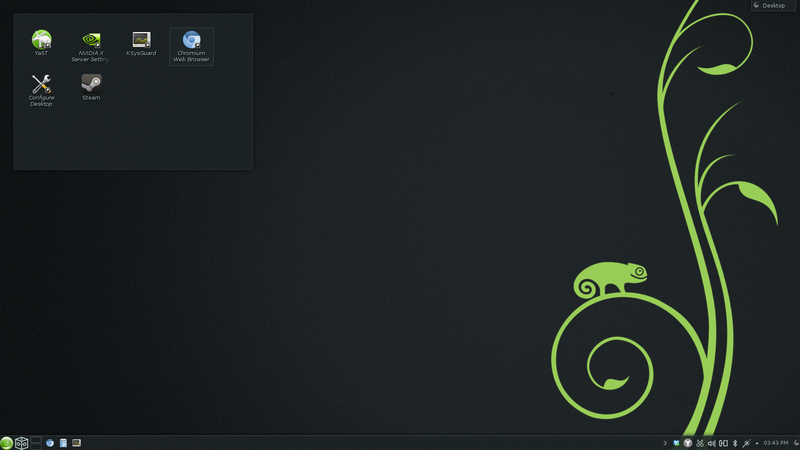 Read more about KDE at openSUSE. 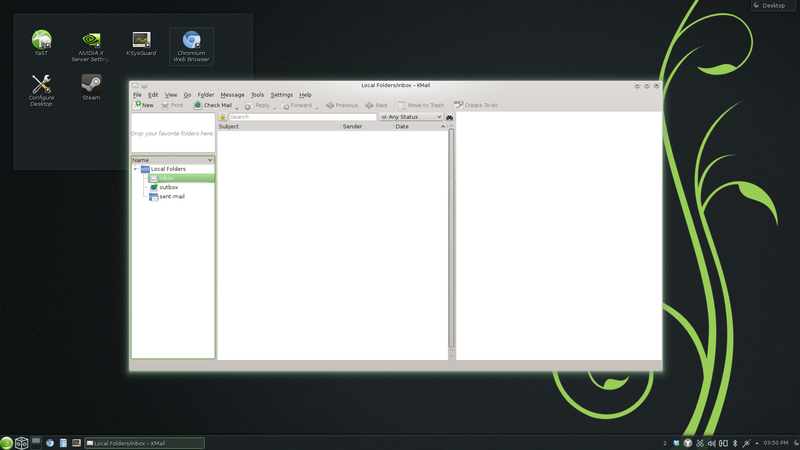 KDE Software is preselected on installations from the openSUSE DVD, so just click through the installation. If you prefer to save download time, burn the Live KDE image to a CD or a USB stick - all the same software is available online via YaST Software Management. 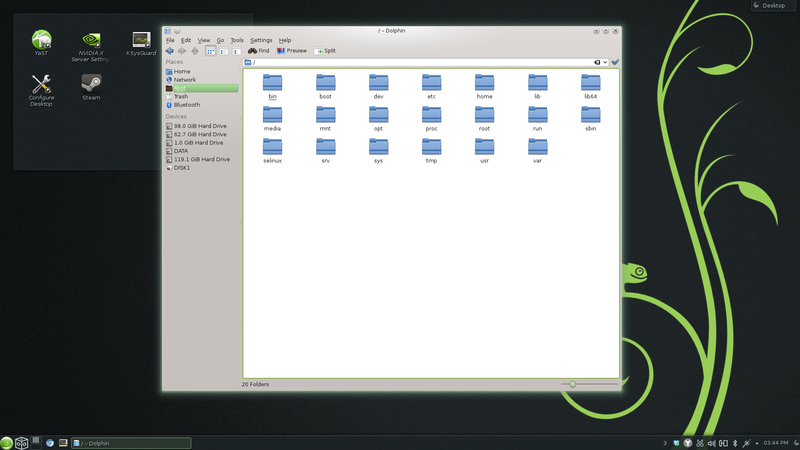 Plasma Desktop from KDE is the default workspace on openSUSE. It offers you an elegant working environment that takes full advantage of your computer's capabilities and the latest technology developments to support you in the way you want to work or play. It combines the power of Qt, the leading toolkit, with KDE's high-resolution, quality artwork, clean, unobtrusive themes, powerful widgets, WebKit for online content and useful experience effects into a consistent desktop that can be shaped in nearly limitless ways. The default configuration provides a conventional desktop, but Plasma Desktop's flexible design gives you the power to intuitively arrange panels, menus, icons, and widgets. As Linux is the Free operating system, there are naturally many alternatives available to suit your taste, both from the KDE Software Collection (Konqueror, KOffice) and from other providers. 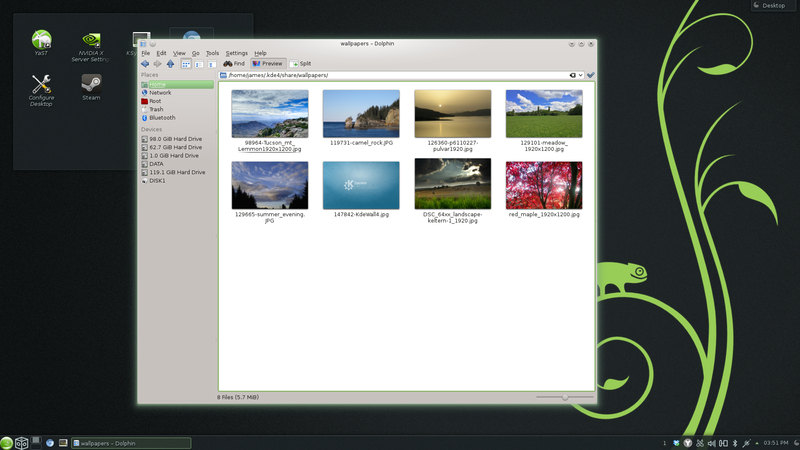 You can also use KDE applications under other desktop environments with no loss of functionality. As the first Free Software desktop project, KDE brings you over 14 years of constant development as well as an undiminished thirst to innovate and improve itself. KDE has been the home of many firsts on Linux, including desktop interprocess communications, a common notification system for applications, a shared address book, person-centered Instant Messaging, and an enhanced clipboard. 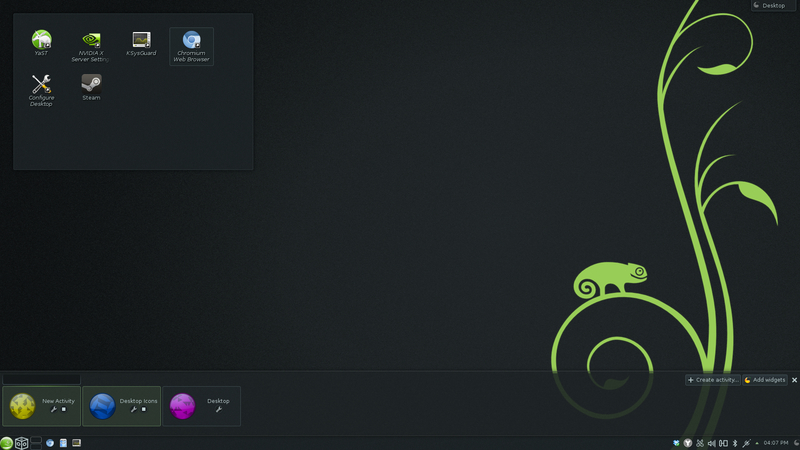 KDE on openSUSE aims to be the best platform for continued innovation for KDE developers by offering great tools and publishing platform in the openSUSE Build Service, and by constantly contributing directly to upstream KDE. KDE Portal For lots more about KDE on openSUSE, including how to contribute to the openSUSE KDE experience. KDE repositories is useful if you want to learn what repositories can be combined and what should not be mixed at all. This page was last modified on 26 October 2013, at 12:32. This page has been accessed 425,803 times.